Did you know you can mark and leave feedback via Turnitin on your iPad? The App provides all of the functionality you have via the desktop browser. This means you can mark and leave feedback using an iPad giving you flexibility away from your desk, once you’ve set it up from your desktop PC. You’ll need to make sure you have the latest version of the App installed, and access to the email account on the iPad you’ll use when sending a link via Blackboard. Open a student assignment and in the Feedback studio, click on the small Information icon as shown below. You’ll then need to enter the email address you can access on your iPad to open the assignments, then click Email me. Once you’ve added the class, you can then access the Inbox and view the Turnitin assignments and then the student submissions. 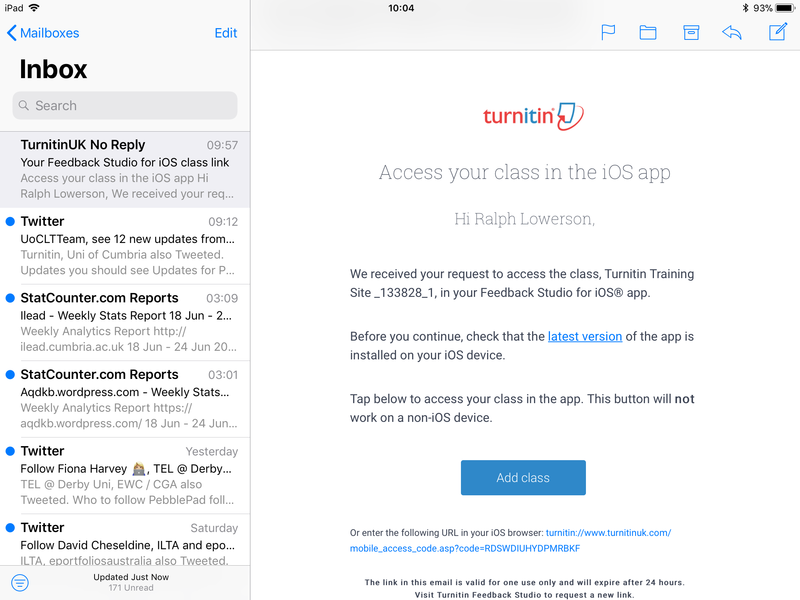 Any changes made to your Turnitin classes and assignments will automatically synchronize with the Turnitin Feedback Studio for iPad app every 5 minutes. Any changes you make via the app will also sync to Turnitin in your browser every 5 minutes. You must be connected to the internet for these updates to take effect. For further information on using the App, please see below.